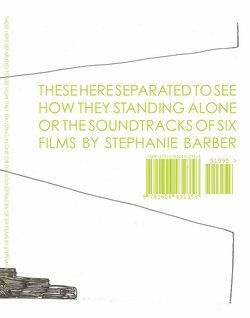 Included in this book and DVD are the soundtracks to six of Stephanie Barber's experimental films. Reading the text while watching the films augments and enriches the understanding of Barber's dense and lovely work. Out of the pairing comes a distinct, engaging literary and cinematic experience. Stephanie Barber has had screenings of her film and video work at MoMA, NY, Anthology Film Archives, San Francisco's Yerba Buena Center, Chicago Filmmakers and The Madison Museum of Contemporary Art. Her performances have been featured at the Baltimore Museum of Art, The Milwaukee Museum of Art, The Haggerty Museum of Art and galleries and artspaces around the world. Stephanie Barber currently lives in Baltimore, MD USA. Her book, poems, was published in 2006 by Bronze Skull Press.